Provident Metals, located in Dallas, Texas, has a long history of buying and selling precious metals in Texas and only recently opened up a web presence to meet domestic and international demand. They focus on exceptional customer service, incredible selection, affordable investments, discreet shipping, and secure online purchasing. Providential is GREAT at what they do. Selection, price, and delivery couldn't be better. Best I've found. Look no more! Great experience. I've never purchased metals online before. After some searching, I found that Provident Metals was the most cost effective when it came to shipping / product cost combined. The product is unbelievable. I didn't know what to expect, except my order. But wow in my own hands 20 pounds of any metal is amazing. Will def. purchase again. Super great experience and love the product. I was curious about delivery date and the procedure in regards to delivery; so I called customer support and had a fantastic representative who quickly informed me and set my mind at ease. I was so excited I told a friend about your products, who also voiced interest. I'm so pleased with your services, I definitely will be ordering more products as I gather my non-money making cash and convert it into this exciting market~! Provident Metals really delivers. I have never any complain about the company or their products. They ship on time, have great prices, huge selection, easy to understand website. I will keep making business with Provident Metals! Just started buying silver not that long ago and I chose provident metals. Now I won't really buy my precious metals from anywhere else. They are fast, easy, and ideal. I made the decision a while back to start buying silver. Provident had a nice variety, good pricing and when I emailed with questions I received fast and professional advice. I enjoy the deal section (50% off) as a good way to buy and get my feet wet so to speak in metals and they make nice unique gifts. I have bought bars, rounds and coins. The product is always as stated and arrives quickly and packaged well. I will be back to buy again. Excellent Products, Prices and Delivery! I have bought a fair amount of gold and silver over the past year, and Provident is one of my favorite dealers and perhaps my favorite dealer. Their shipping speed is really second to none and they have among the best prices on the internet. My latest passion is poured silver, which I have bought a TON of (actually about 430 ounces of) in the past month. I've bought plenty from Provident and if they carried more variety (from various mints) I would buy more. I always check Provident when considering any purchase and will remain a loyal customer for the foreseeable future! Great company! I've placed 4 orders in two months. Every time the package is shipped and received before I expected it. Merchandise is well wrapped and arrives in pristine condition. Prices are great! My first ever silver order was with Provident. Great selection and some of the best overall prices. Shipping was slow and concerned me. 2nd order shipped way faster and 3rd order even faster. I am glad I stuck with them as the merchandise is top notch and I look forward to each and every order. I think it may be time to place another. Thanks for everything !!! Provident is my PM dealer! I have been buying from provident for 8 years. These guys are great! I love their selection of coins and their website is super user friendly. Everything they send is almost 'over packaged' and over wrapped so your coins arrive perfect. There are a lot of good dealers out there but these guys continue to have the best prices and customer service that I can find. I also have never been bugged by a sales person in 8 years of buying. If I could have my paycheck direct deposit to provident... I would, but my wife thinks I am a little excessive. Only the future will tell..
Great Prices as always. This order was much slower than my last. I paid with an e-check, and it still took 20 days for my package to arrive. I've been searching for the best prices for both silver and gold and nobody has beat Provident yet. They've consistently been a few cents to dollars cheaper than other competitors. I thought shipping might be an issue since we live so far away, but it wasn't. I've gotten everything I've ordered within 2 weeks. I've used customer service only once with no issues. Very satisfied with this company! I've placed a few orders with Provident, they are one of the better bullion companies out there, I will be continuing to buy from them in the future. Have ordered from other coin/metal dealers and they bug you to death after you order a product from them. I placed the order with this company and delivered as promised. They let you order when your ready no harassing phone calls trying to sell you a coin deal of the day. The day these guys do I won't use them either until then they are my go to guys for coins. My order arrived earlier than expected. Just would like to see the prices closer to spot. Spot is $15.87 and your prices ares are in the mid $20.00 to $79 for coins and , bars and rounds that are not NGC or PCGS certified. I understand the premium, but the actual prices are a higher then expected. Love the fast shipping. Orderd the RED HORSE aand WHITE HORSE and could not be more happy. Also got some air-tite capsules and they fit the coins perfect and were clear as a bell. Quality service all around. I will be back for more coins. I had a good experience with this online dealer. I would recommend this merchant to anyone that is trying to start collecting or already a collector. Love the details on the silver. Don,t like it costing more for using debt card, and last order taking to long to get here. I've had a few orders from Provident. They are reliable and I have had a good experience every time I've used them. I am confident that I will use them again! I love this place. The perfect silver rounds at the corrrect price. Bought from the (4) bad packers and slow shippers with high prices. THEN, PROVIDENT. WOW! You need to give the Texans a try: you will be as pleased as I. Limited income; I gotta be careful, astute, frugal. Received my first awesomely-packed, across industry price-compared full cart order; couldn't be more pleased. (Got her a "Thor" colorized, 'oooh!') Next month's cart for my newborn Great Granddaughter's Sweet 16 is already packed, waiting! PROVIDENT, (the only one) doesn't dump my cart when I log off! It is still there ready, waiting for me. Try PROVIDENT. I like the special bullion. I have bought the limited run coins and the silver bullets. I had a great experience with the orders I have placed and when I show my newest items to friends they always ask where did you find this. I always answer provident metals. Placed order and received prompt service. Provident is competitive on pricing among online retailers of bullion, and enhanced by easy to navigate website. I had a minor question in regard a recent order, and my phone contact was handled cheerfully and professionally by Provident's customer service person. I highly recommend Provident. I think they have the best specials and often the best prices. Free shipping is great. The turn around time was 14 days for a check payment. I bought my coins as a surprise to my wife although the shipping took a little longer than the 2 day priority I paid for but all in all I definitely plan on ordering more coins and other metals from this company. I also like that they're located in Texas. Quality service. Their Elemetal products are outstanding items! First timer with Provident, so naturally started small and I have to say when all said & done Provident came thru with flying colors ! Great selections, very competitive pricing & fast turn around. 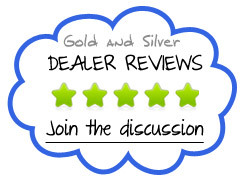 I will be a returning customer and have already recommended Provident to a fellow buyer. Fast Service and a great selection of silver. I keep going back to get more. I will buy from them again! Offers great price points for those trying to add metals into their portfolio while on a budget. No complications with shipping or exorbitant ip charges! Great value overall! You were out of stock on an item so I clicked on "Notify Me". Next time I went on website the product was available, but I was never notified. Now I feel like I you didn't pay attention to my request. I am sure it is all computerized, but that doesn't resolve the issue. Great customer service requires stuff like this not falling through the cracks. Easy and informative website. Best prices on American Silver Eagles. Although some of my coins and rounds had very visible defects. also, for some reason USPS is the slowest in the country to ship from there. It also took 2 days to ship the order. Otherwise good experience. Wish they had more of a selection too. Like collectable seres and such. I have two grandsons and after looking at the Knight coins I wanted to get them a set. I haven't ordered them all for they or not out but will be picking the the sets as soon as they became available. I have been buying ASE coins for several months from Provident. I could not ask for better service, price or quality. Always go the extra mile to communicate and shipments have been on time every time. Love this company. Hope to do much more business with them in the future!! I've placed several orders with Provident Metals this year 2017, and always got exactly what I ordered quickly, product as described consistently which is paramount, and always at good price value for the market at the time. How shall I say .... Provident is "spot on" ? LoL. Very enjoyable experience with this supplier. Got the first of the four horseman of the apocalypse along with some other coins and they were delivered quickly and they are. Beautiful coins thank you! Received beautiful pair of Elemental Mint Beauties. 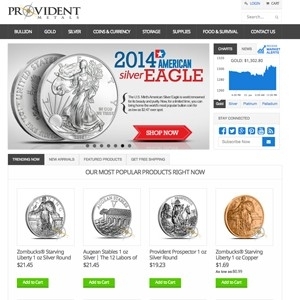 Provident is terrific in all aspects of delivering service and great precious metals! I like the prices and quick shipping. It would be nice to have more of a variety of silver coins so that I wouldn't have to buy from other dealers. This is my 3rd order in 3 months. Each order has been positive and the coins look great. Even the ungraded coins look spectacular. 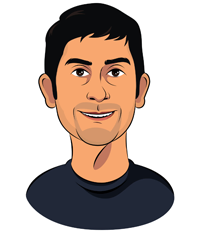 Once I reviewed the website and understood the ordering process,I found it easy to order. My purchase was delivered as as stated in the website. I will be using Provident as my primary source for metals. It was my first order with Provident. Very prompt service/delivery. Coins delivered in individual plastic protective sleeves. Beautiful Canadian Maple Leaf coins (BU means BU at Provident). Will definitely order again. Fast order processing and shipping. Coins accurately described and Provident always has a great selection and good weekly deals. I purchased 5 of the BU Peace Dollars and although it would have been nice to get some variety in dates (all 1923) the description is accurate. I've been a long time customer of Provident Metals buying certified slabbed commemorative silver dollars, silver bars and BU Morgan Dollars in addition to the BU Peace Dollars mentioned and have never been disappointed. When i buy metals and pay premiums i expect certain things in return. First and foremost i what to receive exactly what i pay for and certain guarantees that the big sellers offer. Second, i want a price competitive with killer deals. Provident gives exactly that. I bought a few 1oz Silver Eagles. Shipping was fast and I had my order in just a few days. Each coin was in it's own protective pouch. Great buying experience!! Bought silver eagles and a few walking liberty half dollars, coins arrived very well packaged, tracking numbers, etc. Their prices are amazing and the quality of their product is even more so. The walking liberty half dollars I bought were supposed to be "junk" silver and they are detailed, full readable dates and are now part of my collection and not part of the "junk" pile.